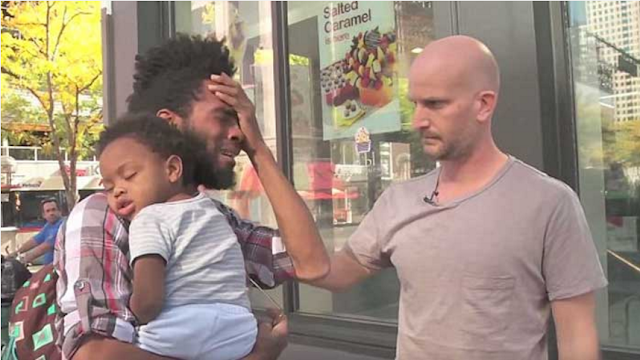 The life of a homeless single father changed drastically after an encounter with a philanthropist that was making a video to promote kindness. James Moss had moved from New York to Denver for a few days with his 1-year-old son Zhi when he met Leon Logothetis, a man who has traveled the world to spread random acts of kindness. James told Leon that he had given up his life in NY to give his son a better life, making the move after a friend offered him a job and housing arrangements. After telling his story, Leon thanked him for sharing his pain in front of the cameras and then said that he was going to show his appreciation by giving him $1,000 and putting him and his son up in a hotel for a week. This heartwarming moment was posted on YouTube on November 3 as part of Leon’s #GoBeKind Tour and has since been viewed over 730,000 times. Leon partnered with Trivago, the travel company that’s trying to make a difference. They help him travel across the U.S. to spark a contiguous chain reaction of acts of kindness starting with unsuspecting good Samaritans. This episode with James Moss and his kid is the 4th episode of the #GoBeKind Tour. What did you think of the footage? Let us know your thoughts in the comments below! If you thought this was heartwarming and want Leon to continue doing this random acts of kindness then don’t forget to SHARE this post with your Facebook friends!